If you’re in need of a vacation, take this roller coaster ride with Shel Israel, who’s on a mission to explore social media when it comes to companies, a topic I’m focused on as a researcher. Sea World worked with Kami Huyse to “move the needle” to reach out to an influence community called “American Coaster Enthusiasts” to reach them using social media tools. They used YouTube, Flickr to publish their media and encouraged the community to use the videos (creative commons rights) and were encouraging content to be created. You’ll learn that this six week campaign reaches specific downloads and activity, some were downloaded 100,000 times. What about this makes a good strategy? Sea World found their passion community (many brands have one) figured out how to have a discussion with them using their tools, let go of their own content for it to spread and be used by that community, and resulted in positive increase in product (park visits) usage. What could they do better? Sea World should involve the coaster enthusiasts to help design, build, and promote the next generation coaster. Sea World could also sponsor their site, hold and event for them, and figure out other ways to make them brand ambassadors. Towards the end of the video, they make some pretty incredible findings on how people found out about the real-world park through the web. Also, I recommend you follow Shel’s Israel’s blog, or his Twitter account to learn more the impact of social media on culture. Is it just me, or did the opening remind you of an older (ok a lot older) version of Johnny Knoxville? Update: Kami gives an summation of the whole campaign, over a year later. For counterpoint, econsultancy raises important questions about metrics and measurement. The market pressure to create technology products that protect or at least damage their impact to the environment continues to grow. Sustainability and green-tech campaigns are coming from nearly every tech company –esp hardware manufactures. Dell is no exception and launches this Regeneration campaign. I’ve not spoken with the Dell marketing team, but it’s pretty obvious this is a campaign helps to help improve Dell products to be more eco-friendly, and of course, spur affinity torwards the brand from green leaning consumers, the ReGeneration site has more details. Dell Computers, along with Federated Media (A social media marketing agency), and Graffiti Wall (A popular self-expression Facebook application), deployed an interactive marketing campaign that encouraged existing Graffiti artists to be involved in a contest that spurred a member created campaign resulting in affinity towards Dell. 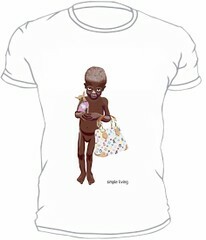 The artists were encouraged to ‘own’ the message, their creativity would spur a contest, and would continue to fuel the campaign. I was briefed by James Gross, who shares his thoughts mid-flight, a Director at Federated Media, as well as CEO John Battelle (interview), and they explained the contest to me. Graffiti is a self-expression application in Facebook. It has popular (rated 4 out of 5 stars) Based on 242 reviews, and has 177,506 daily active users. Rather than creating a new application, this campaign took advantage of an application –and community–that already existed. 2) An art contest: What does Green mean to you? Over 7000 pieces of artwork were created and submitted to the contest. If you watch the replay of the art being created, you’ll see hidden messages (like easter eggs) from the artists as they discuss what green means to them. Many of the drawings had the Dell logo or the regeneration logo embedded in it. The Regeneration microsite promotes a few contributors. There were few negative pics that would detract from the campaign, as the community of existing artists will self-regulate and vote off pics that were not appropriate. Voting began on the second week by the members and over one million votes were cast. The winners were from United States, Canada, Sweden and Maldives. You can see the actual winners here, or click image. The campaign was a success, thousands of engaged members participated, created the campaign on behalf of Dell (similar to the Chevy Tahoe campaign a few years ago), and the community was rewarded. I don’t know for sure, but I’ll guess the majority of the campaign dollars were spent creating the microsite, then hiring FM, and working with Graffiti. The monitors, were likely less than a $1000 each. When it comes to social media, the mentality of short lived campaigns should go away. Communities existed before a brand reaches to them and after the campaign stops. Marketers should plan for long term engagements with these people, rather than short two week spurts. There was clearly traction here and now’s the time to step on the gas and continue forward. Secondly, the artwork created by the winners (and runner ups) should be included in future products, such as digital wallpapers, in the primary branding for Dell, and even the artists should be given an option to continue as sponsored artists. With the relationship forming, take it to the next level. Encourage artwork to be part of next generation green computers, with proceeds going to non-profits or back to the artists to continue forth. Thirdly, the campaign was limited to Facebook, which isn’t the extent of artists on the web, as well as limited to other social networks such as Bebo or MySpace where similar communities can be found. The contest should have been created not just within the walls of a closed gardens, but also spread to the open web. Unlike most marketing campaigns that deploy heavy ads, fake viral videos, or message bombardment, this campaign let go to gain more. Overall, this is a successful campaign as they turned the action over to the community, let them take charge, decide on the winners, all under the context of the regeneration campaign. The campaign moved the active community from Facebook closer to the branded Microsite, closer to the corporate website, migrating users in an opt-in manner that lead to hundreds of comments was clever. Well done. As a vendor, part of your job is to represent yourself well in front of prospects, customers, partners, media, investors and analysts. In nearly all of those cases, you’ll be expected to tell a case study. In the space that I cover there are over 70 vendors, and you really will need to stand out of the crowd, telling an effective, memorable case study can really help. First of all, think of a case study as telling a story: start with a start, end with the end, there is a plot, characters, opposition and an ending with a resolution. Use diagrams or slides or screenshots to supplement the discussion. Define what the problem or challenge that your client was trying to overcome, express why the marketing campaign was needed in the first place. Examples of an objective could be: the need to connect with a certain audience/market, raise awareness for a product, glean insight into an existing market, or directly impact sales. Ideally the less objectives you have, the more focused your campaign will be, so try to be succinct. In detail, outline the steps that you did for your client, include the features, services, and deployment. Give specifics: reaching to acommunity, endorsing a contest, deploying ads, or launching a series of podcasts. Of course, each activity should align with your objective(s). Many vendors are afraid to show their weaknesses, instead be forthcoming, no campaign ever goes perfect or the client would have done it themselves. Talk about challenges and how you overcame them or what you learned. Demonstrate your flexibility and ability to be a quick savvy marketer. In some cases (such as an Analyst briefing) it can be to your advantage to discuss costs and pricing, because: 1) Analyst can guide clients to the appropriate vendor if they have price considerations 2) The Analyst likely has pricing of your marketplace and if you ask, they may tell you how you compare to market pricing (of course, never giving away confidential information). This can be on or off the record, and they will respect your wishes. Still uncomfortable? use ranges of prices or price bands. This is the clincher. Provide detailed analysis and results on what you accomplished. Use numbers. For example: 100,000 new registered users were gained and 30% of them were very active resulting in an average duration of 20 minutes where 1500 of them talked about the campaign, click through to a microsite, or interacted with a game, etc. Yesterday, I gave a teleconference on Facebook as a ready-made marketing program. I gave a few examples of success, and the audience was hungry for success metrics and numbers. One of the case examples was about rebranding an application/widget in this case, Rock You’s vampire application. Vampires, which you may already know as the RPG where members bite each other to receive points (and duel) was already popular with over 3 million installs in Facebook. Sony pictures, the parent company of the very scary 30 Days Night vampire horror film rebranded the existing application, and launched a sweepstakes contest to generate registrations and glean intelligence. The grand prizes? 4 wheel ATVs and $1500. 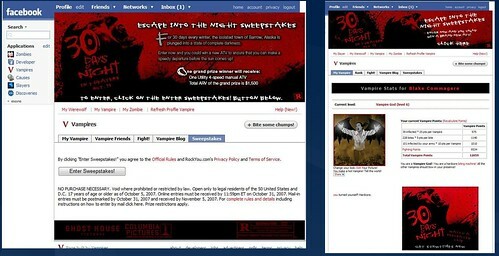 Specifically, they placed banner ads on the rebranded vampire applications which promoted the movie (one could assume that those who opt-in for the vampires application would also like a vampire movie) promoting the sweekstakes. The visits (I don’t know if they were unique or repeated) were 11,642,051 for the bite page, and 17,652,567 for the stats page (I believe these are part of the interactive experience of the game. Sony was happy, it exceeded expectations, and users of the application weren’t over branded. RockYou asked me to keep the price confidential, but based upon the results they told me, I suggested they double the rates, this is despite what Mashable reports on. Fishing where the fish are: Sony figured out where the already existing community was (remember to fish where the fish are) and rather than trying to rebuild something completely by scratch, they leveraged an existing successful application. Rely on specialists for new arenas: In my many briefings with vendors and clients, specialized firms often provide something a general interactive firm or corporate web marketing team can’t. They have experience, know their area, and in this case, they knew to rely on someone that already knew Facebook. Compliment the existing user experience: Sony didn’t beat the 3 million existing users with heavy advertising (and I’m sure RockYou wouldn’t have let them) over the head, instead offered value by giving away prizes, and tied in a movie that already existed. The campaign lasted longer than 3 weeks. Rather than simply embedded, Sony could sponsor elements from the movie and integrate within the game. (vampires could fight at different scenes from the movie, key characters from the movie could become non-player characters, etc). They already have a multi-player game that could have tied in. A spin off game could have emerged just around the game, where members could give virtual gifts to each relating to the movie, then cross-selling other sony products and merchandise. Also realize there are very few applications in Facebook that are this popular, don’t expect these type of results to occur every time. Looking bigger, RockYou isn’t the only vendor doing this type of work, also see Slide, Clearspring, Gigya, and a bunch of others. If you’re in the space, feel free to leave a comment below adding to the conversation. For those Forrester clients who attended the webinar, I hope that clears up the question (as I promised to find the answer), and thanks to Ro Choy and team of Rock You for the details. If you need to know more, read this weekly digest of the social network industry, or see all posts tagged Facebook. 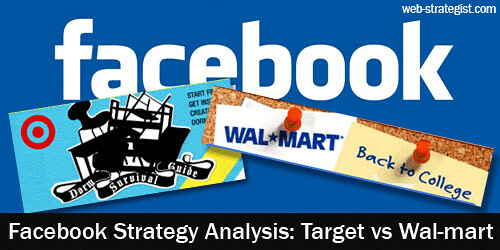 Web Strategist Connie Benson pointed out the Target Wal-Mart Sponsored group in Facebook isn’t getting a warm reception. As I cruised through the group, I noticed a much higher degree of interaction, amount of members, and community engagement. Please note, it’s impossible to tell who’s really behind some of these comments and threads, some could be hired on various services. I need data to check interaction levels, only Facebook and the respective companies will have this. I would want to see, time on site (attention), interaction levels, spikes and trends, and other information. Last month, I published a White paper on Social Media Measurement (co-authored with Matt Toll) and I could easily quantify these numbers are return a score card, if I had more time (or if it was my job) I would measure and score. Regardless, it’s clear that based upon engagement and interaction that Target is performing much better. Students even linked to their “Dorm room tours” on YouTube, whereas Wal-Mart lacks a discussion feature. What’s the difference between the two strategies? Target is clearly involving students to shape and be part of the group, whereas Wal-Mart’s strategy appears to be more of interactive web design, which is evident as the discussion forum is not enabled. I also suggested to Wal-Mart to consider an authentic evangelism program, the comments suggest a female evangelist would be best. Update: If you want to know more about Facebook, read my Web Strategy: What the Web Strategist should know about Facebook. Also, I’ll be Keynoting The Seattle Facebook Conference on Dec 5th.